The landmark State of the Tropics project is in the running for a prestigious sustainability prize, emerging as a finalist for one of the coveted Green Gown Awards. 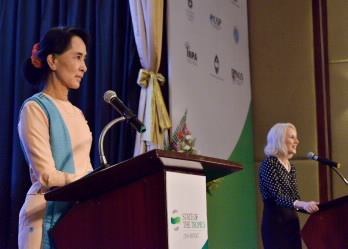 Nobel Laureate, Aung San Suu Kyi and JCU Vice Chancellor, Professor Sandra Harding at the launch of the State of the Tropics 2014 report in Yangon, Myanmar. The Green Gown Awards Australasia recognise and reward universities and other tertiary institutions for their sustainability actions and initiatives. Led by James Cook University, the State of the Tropics project is a ground-breaking initiative that brings together leading research institutions from across the world’s tropical regions to answer the simple question: is life in the Tropics improving? Nobel Laureate, Aung San Suu Kyi, launched the project’s first major report in Yangon in June. The project is a finalist in the “Social Responsibility” category. James Cook University Vice Chancellor, Professor Sandra Harding said the nomination reflects the quality and breadth of the State of the Tropics project. Professor Harding said the report demonstrates the great demographic, environmental and geopolitical significance of the region, describes the grand challenges facing the world’s tropical regions, and provides a baseline for a more sustainable global future. “Given the international collaborative nature of the project and widespread publicity, the capacity of this project to raise awareness of sustainability issues facing the Tropics cannot be overstated,” Professor Harding said. Last year JCU won the “ACTS Award of Excellence - Institutional” for its efforts to boost sustainability. The winners of the 2014 Green Gown awards will be announced in Hobart on November 6th.